thiruvAimozhi – 8.5.6 – koNdal vaNNA! In the sixth pAsuram, AzhwAr says “As I think about your beauty etc and call out saying ‘I want to see you’, you should mercifully come and appear somewhere for my upliftment”. vaNNA – oh one who is having form! kudak kUththA – Oh one who dances with pots (which is heart-captivating)! kaNNA – Oh one who is the vision! 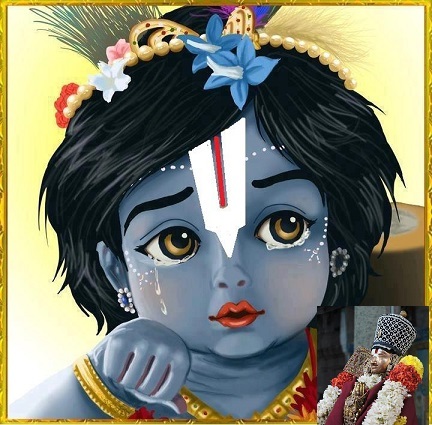 kaNNA – Oh one who descended as krishNa (to manifest your obedience towards the devotees)! aNda vANA – Oh one who remains as the controller of paramapadham! When I call out for you to enslave me in this manner saying “Oh one who is having cloud like form! Oh one who dances with pots! Oh one who is the vision for me, who is having sin! Oh one who descended as krishNa to be my attainable goal! Oh one who remains as the controller of paramapadham!” one day you come and be present for me who is greatly desirous to see your divine feet, being in paramapadham or being in this world or being in kshIrArNavam or being in my heart. koNdal vaNNA – Oh one who has a form which will remove the fatigue of those who see you! kudak kUththA – Oh one who has heart-captivating activities! vinaiyEn kaNNA kaNNA – Oh krishNa who is my vision! vinaiyEn – I have committed sin to lose my vision. en aNda vANA enRu – Oh one who became the lord of the universe to accept me! AzhwAr says “Just as his being with auspicious qualities is for the sake of his devotees, his having wealth of these spiritual and material realms is for me”. ennai ALa – Am I calling you for any worldly benefits? Am I not calling you for engaging me in eternal service? kUppittu azhaiththakkAl – Are you delaying your arrival thinking I can wait to attain you in due course of time? Are you thinking “let me go in due course of time” and remaining there even after hearing my sorrowful cry? viN than mEl thAn – You can appear in the sky where the water-filled cloud is moving around. viN than mEl thAn – You can appear in front of me manifesting your presence as in paramapadham. maN mEl thAn – You can appear by incarnating [in this world]. maRRuth thAn – You can appear in front of me as you appeared from within the pillar (as narasimha) or as you appeared for the elephant, gajEndhrAzhwAn. thoNdanEn – I who am desirous in serving your divine feet. un kazhal kANa – To see your divine feet which sustain me. oru nAL vandhu thOnRAyE – Am I insisting that you do this (showing me your divine feet) for many days? To sustain me, you should mercifully appear one day. This entry was posted in thiruvAimozhi, thiruvAimozhi 8th centum on March 23, 2019 by Sarathy Thothathri.